The prices of risky financial assets tend to rise over time. But investments that offer high returns typically entail higher risks. It is therefore said that risks should be taken by those most able and willing to accept them. Life insurance companies provide a broad range of long-term savings and pension products. Most operate by receiving premiums up-front and investing those premiums in financial markets until funds are eventually paid out, often in many years’ time. Given life insurers’ long-term investment horizons, they are well placed to hold onto risky assets through cycles in financial market prices, perhaps even buying more when prices dip. By doing so, insurers might act as stabilisers in financial markets, dampening down the effects of other financial market participants that invest procyclically – that is, sell as prices fall and buy as prices rise. In reality, insurers may not behave like this. The structure of regulations, for example, can impact insurers’ incentives to hold different types of financial assets, both in steady state and in the face of changing market prices. As of January 2016, UK life insurance companies became subject to ‘Solvency II’ regulations. The new rulebook contains a number of ideas present in the previous regime. Most significantly, insurers are still required to maintain at least minimum levels of capital. But the regulations also introduce other, more novel ideas. For example, the new regime seeks to ensure that insurance liabilities can be readily transferred across different firms. To achieve this, insurers are asked to set aside extra assets to pay the excess premium – or risk premium – that would be demanded by another insurer to take over their liabilities. Under Solvency II text, this additional premium is called the ‘risk margin’. And its introduction provides a simple insight into some of the trade-offs often involved with the design of regulation. In particular, the new liability should improve the resilience of the insurance industry, but it could also influence insurers’ investment behaviour, possibly in perverse ways. A thought experiment: what happens if lightning strikes twice? So, given that UK life insurers now operate under Solvency II, how would one expect them to respond if the 2007-08 financial crisis were to repeat itself? That is, how would insurers respond if risky asset prices were to buckle once more, and, in response, monetary policy authorities were to loosen policy? Well, given the infancy of the new regime, there isn’t much data to observe how insurers are likely to behave in times of such market stress. 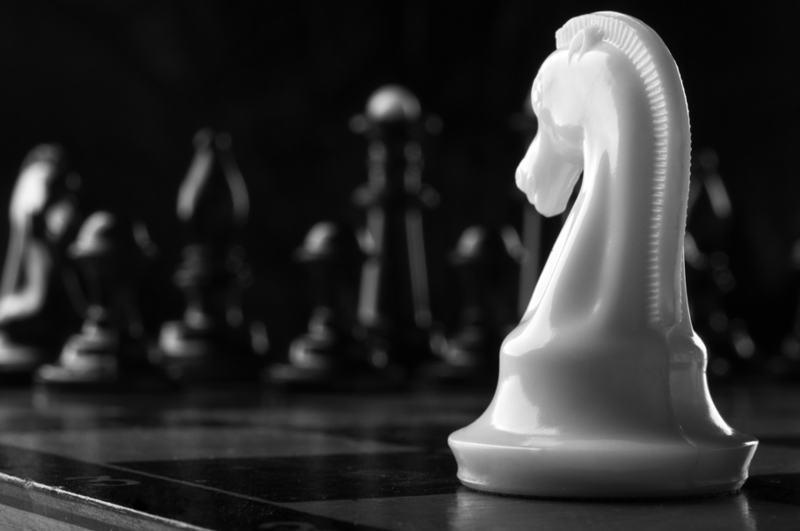 We have therefore developed a model of insurers’ asset allocation decisions, which we use to estimate the investment behaviour of UK life insurance companies that operate in a world where Solvency II has been phased-in completely. To do so, we decompose our assumed Lehman-type market shock into two components. First, we estimate how insurers are expected to respond to a 10% fall in corporate bond prices. Second, we look at a 100 basis points downward shift in the yield curve. Notes: 1) The model is parameterised to a hypothetical UK life insurer that is created by combining the balance sheets of large annuity writers. 2) The model assumes that Solvency II has phased-in completely; that is, transitional measures (so-called TMTPs) have fallen out. 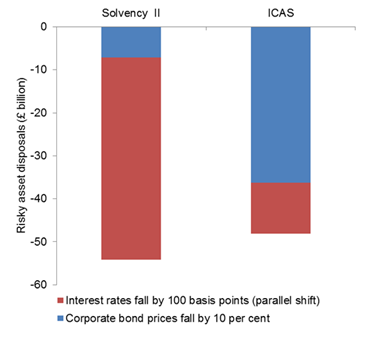 Isolating the fall in corporate bond prices, we find that insurers sell fewer risky assets under Solvency II than under the previous regime, ICAS (see blue bars in Chart 1). This result is driven by the so-called ‘matching adjustment’ – a new measure introduced under Solvency II that cushions insurers’ capital resources in the face of falling corporate bond prices. It does this by enabling them (subject to conditions and prior approval) to look through certain short-term asset price movements when valuing their liabilities. Moving to the fall in the yield curve, we find that insurers, in contrast, sell considerably more risky assets under Solvency II than before (see red bars in Chart 1). This result is driven by the current, formulaic design of the risk margin, which mechanically increases in value as interest rates fall. This reduces insurers’ solvency and thereby encourages them to sell risky assets to reduce their risk of regulatory insolvency. Interestingly, by summing-up the response functions from the two types of market shocks, we see that insurers are likely to dispose of more risky assets under Solvency II than before. The above results indicate that Solvency II regulations introduce measures that encourage both positive and negative investment behaviours. But in aggregate, the more powerful adverse impact of the risk margin reduces UK life insurers’ willingness to act as the white knights of financial markets, particularly in the face of falling interest rates. Of course, like all models, ours is subject to a number of caveats and uncertainties. But the general intuition of our results demonstrates the sometimes perverse impact that regulations can have on institutions’ behaviours. Our results thereby emphasise the significance of considering the implications to financial stability of regulations designed primarily for microprudential purposes. In this spirit, the results suggest greater emphasis should be placed on the development of macroprudential policy tools. Graeme Douglas, Nicholas Vause and Joseph Noss work in the Bank’s Capital Markets Division. Previous Post 10 Years after Northern Rock – is the UK more or less likely to see another bank run? Next Post Bitesize: Are leasehold houses really a thing?